Solotech, the North American end-to-end provider of entertainment technology services, has integrated a Lightware MX16x16DVI matrix switcher into the system that projects the Toronto Maple Leafs’ player intro video onto the home ice at MLSE’s Air Canada Centre. Lightware USA is the US distributor for Budapest-based Lightware Visual Engineering products. Used in the past as a fan “extra” for NHL play off games, videos projected onto the ice itself have become a way to generate fan excitement during regular season games. The Maple Leafs’ video, created by 4U2C, Solotech’s content design company, is a montage of still and moving images showcasing the players, on-ice action and graphic glimpses of the team logo, a rippling flag, even the stitches on the players’ jerseys. Teams face off, sticks clash, pucks fly, players crash and crowds roar in the lead up to the Maple Leafs’ line up hitting the ice. 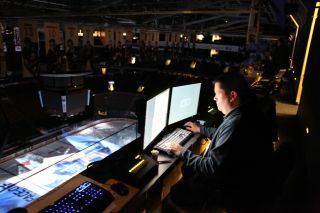 In MLSE’s Air Canada Centre, the Lightware matrix enables technicians to switch any input or output of the system to six double-stacked 20K projectors, which are mounted on the grid above the ice. “We had only three weeks to set up the entire show, so receiving the MX16x16 router from Lightware really fast helped a lot. Since we’re accustomed to working in touring and staging fast turnarounds are nothing new to us. Lightware USA delivered the system quickly,” Lovse reports. The Lightware switcher is housed in a rack in the equipment control center at the venue. Solotech operators supported the video display system for the first ten games of the hockey season then MLSE technicians assumed control. 4U2C can update and create new content as needed by the team.